Will 3M Raise Its Dividend in 2017? The innovative conglomerate has seen its stock climb more than 20% in 2016. Will a dividend increase come soon? Dow component 3M (NYSE:MMM) has a sterling reputation for coming up with groundbreaking products. Serving a wide range of industries, 3M has also made dividend growth a key element of its long-term success. The conglomerate has one of the longest streaks of annual dividend increases in the stock market, making 3M one of the premier stocks among the Dividend Aristocrats list of companies that have made dividend boosts for at least a quarter-century. 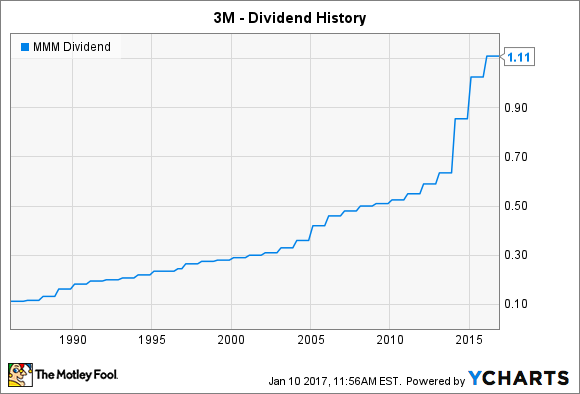 Many dividend investors count on that dividend growth, and so they want to know whether they can expect a higher payout from 3M this year. Let's take a closer look at 3M to see whether it will raise its dividend in 2017. 3M has a long track record of giving shareholders steadily growing dividends, and the conglomerate's payout growth has accelerated dramatically in recent years. In early 2014, 3M raised its dividend by about a third, and it followed that up with a 20% rise in 2015 and an 8% hike last year. All in all, 3M has doubled its quarterly payout since late 2011. 3M typically makes its dividend increases early in the year. You have to go back to 1996 to find an occasion in which the company didn't add to its February dividend payment, getting its annual boost done at its earliest occasion each year. Steady earnings growth has been a key component of 3M's ability to raise its quarterly dividends each year. Over the past 12 months, the company has generated nearly $8 per share in earnings. As a result, 3M can pay its current dividend rate with just over half of its available earnings, leaving the rest for reinvestment into its business, doing stock buybacks, and making larger-scale strategic moves. Moreover, 3M is excited about its future. Last month, the company said that it expects to earn between $8.45 and $8.80 per share, continuing its steady growth trend from its anticipated full-year 2016 bottom line of $8.15 to $8.20 per share. With its intermediate-term targets, 3M expects to generate 8% to 11% growth in earnings between 2016 and 2020, which could support even larger dividend increases. Is a 3M dividend boost imminent? More importantly, 3M explicitly made the link between earnings and dividends at its 2017 outlook meeting. CFO Nick Gangestad said, "We expect our dividend to grow in line with earnings over time." That doesn't mean that 3M's annual dividend increases will necessarily track that year's specific earnings growth. However, when you look at long-term graphs of dividend growth and earnings growth, you should find that they'll track each other fairly closely and end up in largely the same place. That won't necessarily be good news for those who had hoped that 3M's more recent pace of dividend growth would become a longer-term trend. However, a dividend growth rate that mimics what's happening on the bottom line is certainly more consistent with common practice, and it's also easier for 3M to sustain year in and year out in extending its already impressive streak of dividend hikes. 3M has traditionally announced its annual dividend increases before the month of January is out, and there's no reason to expect that the conglomerate will depart from its traditions in 2017. As long as the innovative leader can keep finding ways to boost its bottom line by making the products that its customers want and need, then 3M should be able to deliver higher dividends to its shareholders over the long haul.